Well, the short answer is- do not piss off your customers. For the long answer read the story. 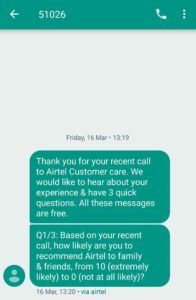 I recently had a follow-up call with airtel customer care regarding network issue in my area. The initial complaint was logged a few months back after that their network engineer visited the site, took readings and agreed that there is poor network reception in this area. Since then there had been no communication from airtel side so I decided to call them up. As expected nothing positive came out of the call, but I would not like to go into those details for now. The interesting thing I would like to share here is the SMS which I received after the call. Dear Airtel, in case you missed it, the call was regarding a complaint which was filed with you a few months back and has not been resolved yet. So how do you want me to respond to your NPS question? Don’t you already know the expected score, well it is 0 (zero). Marketers, just asking for customer feedback, that too when you know the response, would not help you improve your NPS. Get your teams together to resolve customer issues and that not only will lead to better NPS but a loyal customer base as well. For those who are new to NPS. Net Promoter Score® (NPS) is a customer loyalty and satisfaction rating used by thousands of businesses across the world. Developed by Fred Reichheld, Bain & Company and Satmetrix, NPS was designed to help companies measure general customer satisfaction and predict their fortunes over 3 years. NPS was created as a relational survey, designed to be sent to a business’ full database over 90 days. Now, it’s more widely used as a transactional survey, sent to customers after interactions and purchases.